Last Friday night, all roads led to the Philippine Arena in Bocaue, Bulacán when Barangay Ginebra San Miguel, the country’s most popular basketball team, successfully defeated Meralco Bolts, 101-96, in Game 7 of the Philippine Basketball Association’s (PBA) 2017 Governors’ Cup finals. There were 54,086 screaming fans, making the event an all-time attendance high for the PBA (and the second most-attended event at the Philippine Arena, next to “Eat Bulaga! : Sa Tamang Panahon” which featured AlDub). Two days later, the country is still euphoric over the win. Incidentally, last Friday night’s championship was a rematch of last year’s Governor’s Cup wherein both PBA ball clubs found themselves also as finalists. Ginebra also won that conference in four games against Meralco’s two wins. A few days after that game, GMA Network’s Kapuso Mo, Jessica Soho had a feature segment about Ginebra’s championship win. Soho was able to capture the festive mood of Filipinos who went into a frenzy when their favorite team had won. Such joy reminds Filipino sports fans of those exciting days when news of then rising star Manny Pacquiáo emerged victorious over Mexican pugilists abroad. This, my friends, is called the “Barangay Ginebra Phenomenon”. I have always been baffled by this basketball team’s huge popularity. Sometimes I wonder if it has something to do with Robert S. Jaworski, Sr., the legendary playing-coach who once donned a Ginebra jersey for years. More likely, yes. His exciting game plays and “never say die” attitude infected not only his teammates but also their huge fan base during Ginebra’s early years. But he’s already retired a long time ago. The Chicago Bulls’ popularity dwindled when Michael Jordan left. But this never happened to Barangay Ginebra San Miguel when the Big J retired. 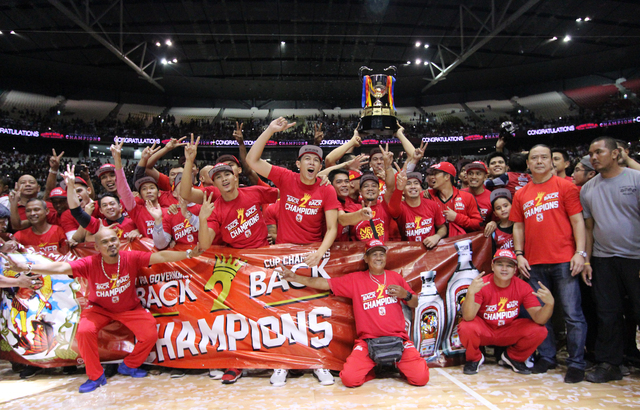 Then I realized something else: could this so-called Ginebra Phenomenon have something to do with historical memory? 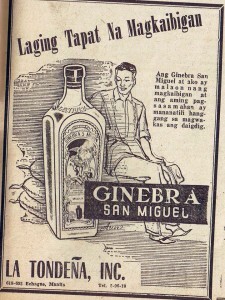 Remember that the product that this hugely popular basketball team represents is Ginebra San Miguel, the world-famous fiery gin which was originally produced by the “Destilería y Licorería de Ayala y Compañía” (Distillery and Liquor Store of Ayala & Co.), now known as Ayala Corporation. The Destilería, located in Quiapò, Manila, was the first distillery in the country. It introduced their trademark gin in 1834 during the reign of Governor-General Pasqual Enrile y Alcedo, or 27 years before José Rizal’s birth. The Manila-Acapulco Galleon Trade has already ended two decades prior. It was also a time when Filipinas was already enjoying its first lottery games. Sometime during the 1910s, renowned artist Fernando Amorsolo designed the “marca demonio” (usually called “marcáng demonio“) product label for the gin brand which is still in use today. Amorsolo later on became our country’s first ever National Artist. In 1929, the Destilería was acquired by “La Tondeña” (The Tondo Girl). Then in 1987, the San Miguel Corporation, another Spanish-era conglomerate, acquired a 70% stake in La Tondeña and renamed it as La Tondeña Distillers, Inc. It underwent another name change, Ginebra San Miguel, Inc. and became a publicly listed corporation. Since 2012, Ginebra San Miguel has become the largest-selling gin in the world. 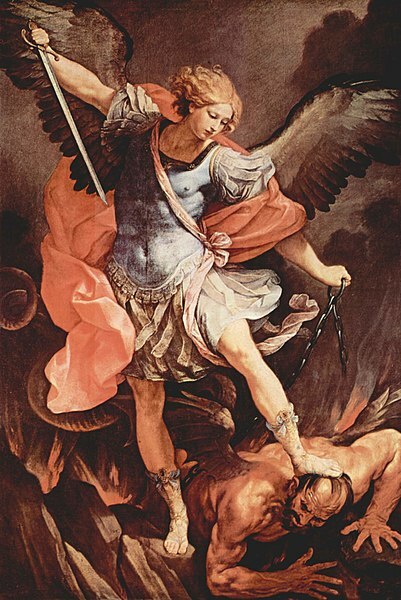 And may we not forget another important fact: Ginebra San Miguel is probably the only alcoholic beverage in the world that is named after an archangel: Saint Michael. This same archangel looms large in Filipino History, as he is the patron saint of the province of Cebú, the municipalities of Argáo (also in Cebú) and San Miguel in Bojol (now spelled as Bohol), the barrio of Landayan in San Pedro Tunasán in the province of La Laguna, and the district of San Miguel in Manila. In fact, the name of Ginebra San Miguel’s parent company, San Miguel Corporation, was inspired from both its former location (San Miguel, Manila) and the fact that on 29 September 1890, the feast day of Saint Michael the Archangel, “La Fábrica de Cerveza San Miguel“, which was the forerunner of San Miguel Corporation, was declared open for business. Saint Michael the Archangel is a familiar figure in almost all churches throughout Filipinas. Images and paintings usually depict him with a sword in hand while giving lucifer a bad day (oil on canvas: Guido Reni, 1636). Need we mention that San Miguel in Manila is the seat of our country’s political power since the late 19th century? But at the end of the day, history and archangels would have to take a backseat on this one. For why would sensible Filipino basketball fans, especially those in Metro Manila and its environs, side with a team that represents a company notoriously known for its exorbitant electric rates? 😆 Ginebra San Miguel, the historic Filipino gin, is all about the celebration of life.